You should know by now that I shop like it's my job...more like a non-paying internship. Online, in stores or off other people...you name it. I've done it. But, the key to my shopping addiction experience is keeping it accessible to not only my own bank account that's far from overflowing with greenbacks, but keeping it in reach for all of you too. I am not saying that I am cheap. I am saying that you don't have to spend a lot to look like you did. There are thousands of shops/brands out there, in my opinion, that offer well made apparel and accessories and many times deliver better quality than higher end brands. That is where OUTRAGE FASHION comes into play. The online accessory company based in California is just that, quality accessories at affordable prices. And let's not just talk quality and price. How about all the utter cuteness, lust worthy designs, studs, sparkles, neon hues, bold patterns and on trend styles. Should I go on? How about this? Take a look at some of my tops picks below. Then visit OUTRAGE FASHION for yourself and see what I am talking about. Pure shopping bliss. Today, OUTRAGE FASHION has been generous enough to offer one lucky friend of Because Shanna Said So a $75 credit to their online store. This will be help pay for all the items you add to your "shopping cart" once you take a peek at all their goodness! **If you are linking up today, I kindly ask that you follow my blog and link back to it in your post. Oh, and go meet some new friends! ***Please don't forget to vote for me. I am in the running to be Wallis' 1st U.S. Fashion blogger. Go here and click to vote. It's a SUPER close race. Every vote matters!!! It would mean the world to me if I won. You can do this once per day until April 9th. Don't worry if you forget, I will be reminding all of you on a daily basis! Absolutely love how you paired the polka dots with the floral. You are a master at mixing patterns!! GIVE ME that bag Shanna! SO dang gorgeous :o You look adorable. In love with the floral skirt! Great look! I love that polka dot shirt and the mix with orange. I've always shied away from orange but it really is a nice pop! Thank you once again for hosting the linkup, I'm happy to be joining for another week! Cute print mixing, and I love the pops of orange! The Alisha statement necklace is so pretty! I love the florals on the skirt-- perfect for spring! I love the black and white chevron flats and the nimrod necklace. Lovely for spring. I love this outfit! The skirt is adorable--and the polka dots on the shirt just make it cuter. I love that the colors are so similar in the mixed prints! Loving your outfit as always! When I was reading where everything was from I thought "I love how her pieces are always affordable!" so to read further on in your post it made me smile. I always appreciate your affidavit looks! Thanks for another great inspiration, Shanna! Super cute outfit girl! I love your skirt!! Love your pop of color with those shoes! You look great. Can't wait to get my chambray and some floral skirts out more once we have some nice weather! Love this one...so fresh and feminine! And I would pick the Normis Necklace. So cute! I love this outfit! That skirt is SO adorable! YAY for a giveaway! I love the Cassandra earrings and necklace! I also love this outfit! The skirt looks great with the subtle polka dots. Sooooo want the Aria zig zag flats in black and white! Going to oogle the rest of the stuff now! So what are you using to edit your pictures now? This skirt is absolutely adorable. And I totally agree...I like when clothes are affordable!! Hey always come up with the best way to mix patterns!! Cute clothes at great prices are always the best!! this weekend i bought two jean jacket for 5 buck each!! im like even if i only wear it twice i got my money worth our of it!! plus you always make them look so cute!! THIS OUTFIT! I die! Love the floral skirt with the top! Love that mint bow belt........and some of the scarves! Such a great outfit! I love the skirt, and the pop of orange just makes it. I'd get the Reema black scarf to brighten up the multitude of black in my closet! Oh man - that Aurian Necklace and the Amanda Tote are my faves! What a great giveaway!! it's a win, win when you like the clothes and the price is right! You look great, super classic. I like their jewelry selection and tote bags! What a wonderful pop of colour with the orange! I love the look of the outfit :) Thanks for hosting, and Happy Wednesday! So THAT'S what it looks like to wear bare legs and a short skirt. I can barely remember, with the long, ridiculous winter we've had in the Midwest. Sigh. Oh, and I will take one of each of the items you have shown from Outrage, please. Love that pop of color with your blue and white outfit! So cute! I would totally get the Aurian necklace from Outrage! Clearly I like pops of color! Love the Juliet tote in mint! LOVE the blues with the orange! Beautiful! I LOVE that bag and how your shoes match exactly! This is probably one of my favorite outfits you've posted lately. I would get the Parisa necklace, it's so pretty! This is so pretty Shanna...love the subtle dots with the floral print, and the bag was the perfect color choice! I love the top tucked into the cute skirt- so feminine and pretty!! I want that bag! I never would've thought to add orange to the blue/white combo but I love it! Great giveaway!!! And love these two prints together. I went to ON yesterday to return a skirt and saw sooooo many cute things. I really had to force myself to not try anything on. It was difficult. I love that bag, I've been looking for an orange one this season! I checked out their earrings, I like so many. Great prices. I would ABSOLUTELY go for that bag you're carrying! It's perfect for spring/summer! Loving the top and skirt pairing!!! And that bag goes so well with it all!!! LOVE it so much! 1. Your outfit is to.die.for!! You look amazing, doll! 2. I'd probably get the tote you're sporty with your outfit or the Juliet tote in mint. that outfit is perfection!!! lvoe that bag! off to check out their site! We were just talking about orange purses this weekend! I need some new Spring jewelry, so if I won, I would pick some of the super cute bright or pastel spring colored jewelry. It's all soooo cute! I like the Rocker Bracelet. Thank you. You look so adorable, I love that skirt! My favorite is the Alisha Statement Necklace! If you are forcing me to choose :) the Reema white silk scarf. But that is just one of about 1000 things I want. what a great giveaway! I think I'm pretty much lusting after those chevron shoes :) hope I win! I don't know if it's your new camera, but your outfits are popping this week!!! No wait, your outfits are always popping. You could use an iPhone 3 camera and your outfits would still pop! I love the Juliet tote! I love the Madison Crossbody in Neon Pink! I would love to get some new accessories for sure! eeeeeek the abana tote is my favorite. i love it! I would choose the Riman Bracelet! As usual, your pattern mixing is amazing! I love the handbags on this site. The yellow Juliet bag was my favorite! I'm sad that I'm sick and can't link up the outfit I was planning for today. There's always next Wednesday, right? i think I would get that bag!! love it! I would choose the Amaya statement earrings! This outfit is fabulous! And that bag, IN LOVE!! I'd definitely want the Juliet Tote, among other things. Soooooo cute & chic.....that's what this look is all about Shanna!!! The Parisa necklace is perfect! I love the Gaby stud clutch! you look amazing!!!!!!!! love their jewelry- they have a few mint necklaces i love! Oooh I love this outfit! I just ordered those shoes online last night. Love, love, love the Vintage Ribbon and Rhinestone Bracelet - Black Beauty. It's made in the good ol' USA! Love everything on outrage fashion! But if I won the contest I would get the Katherine black and white pumps and the Naara Spriral bracelet for sure! I think this is one my top fave of your looks! Love this paired with the pop of orange & pattern mixing!! If I won, I would love the Aurian Necklace. Ah, I want those Chevron flats!! Loving everything from their site but if I won I would probably get the Katherine black & white pumps and maybe the Normis necklace...gorgeous! fab giveaway! I love the Juliet tote in that beautiful light blue and the cassandra necklace is super cute too! I would get the Rose Gold Clear Gem Bracelet if I won! Hope I do! I absolutely love the polka dots and floral together! Thanks for the giveaway - if I won I'd choose the Satin Gold Link Necklace. voted again :) love all the bags at Outrage Fashion. I'm a total purse-a-holic so affordable bags are always a great find! I would choose the Vanessa Fringe bag in Black. perfect size and loooove the fringe! thanks! They're stuff is so affordable! I can think of a few ways to wear the Lorena Necklace! I'd love a statement necklace. The one in mint green is pretty. It's something I probably wouldn't buy. I'm still voting for you! You seriously look sooo cute! I love that skirt! They have so many great pieces! I would go for some jewelry though - I LOVE the Cassandra Necklace and the Sarah Bracelet! PS, good luck with the Wallis competition--I keep voting everyday! I would get the Alisha necklace and the Juliet tote! I love your polka dots and flowers! Tres chic! Love this skirt! Now if Texas would make up its mind on whether or not it wanted to be spring or fall, I would really appreciate it! I love love love that Tanya bag!! Love the jewelry and shoes here! I'd get the Juliet tote! HANDS DOWN! Also, I seriously LOVE this outfit of yours! Oh, and love your look! Ohhhh the paige pumps...the juliet tote...the lila earrings...THE LIST GOES ON! Love this outfit on you, the skirt is adorbs! That bag is fab! LOVE IT! Wow! Lots of comments!! Deservedly so too. Your outfit looks amazing. Love the complimentary colours. Great bag and shoes. Thanks again for hosting. amazing! I am dying for a tote like that! I already told you this on IG, but you look adorable, Shanna! For the giveaway, I'd choose the Tribal Acrylic Ring Necklace or the Rocker Bracelet. Totally forgot about it being Weds until I saw your post on IG ;)Love the look today! Loving that polka dot shirt and the studded bag. Great choices! Alisha Statement necklace! Some of their jewelry reminds me of the super expensive J. Crew pieces....except that I can afford it without selling my car. I love the orange handbag!! Love it...Love it!! You have great fashion sense! Thanks. The Juliet tote is the best! I love all of their items! I WANT THAT ORANGE PURSE! Love it! Shanna, you look amazing, and I am in love with this entire outfit. Also great bag! Love it. You always look so put together! I love the combination of the polka dots and floral skirt. Plus that bag is gorgeous!! dang girl look at those legs! Love the outfit!! I love the Leather and Chain Mesh Collar Necklace! I'd get the Peter Pan Bow Collar Necklace or the Cristina Flower and Bow Necklace. Love your outfit Shanna. The bag is fabulous. If I win, I'd pick the Delicate Leaf Cluster Necklace, the Orion Necklace in Antique Gold and the Navy Blue Skinny Belt. I would get the Niya Necklace if I win! You defiantly get my vote for red white and blue. My gosh that handbag is stunning! 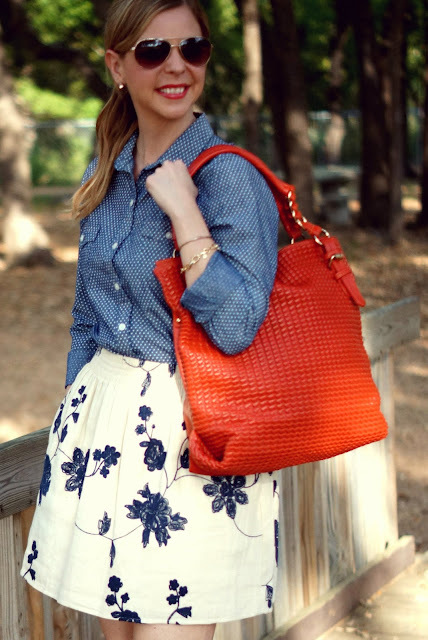 I have this same polka dot chambray, love how you've styled it here. I love the mint Juliet tote! I think I would get the Serena Bracelet for starters! That skirt is TOO cute! I have that polka dot chambray top, but I've never paired it with floral. I'll have to give it a try! Thanks for hosting the linkup! I'm so excited to join! Love the whole ensemble especially the bag! Good luck in the Wallis competition....I've been voting for you! There are some seriously awesome statement necklaces on this site! I love it! I would definitely get the Petals and Blooms Necklace and one other. that skirt is fabulous! love that you paired the denim shirt and pops of red with it! too many cute things! I have been wanting a green statement necklace so I love their version...that'd be the first thing in my cart if I won! Oooh tiny polkadots! I love them! And if I won this giveaway I'd definitely take the Juliet bag in mint! So pretty! I love the Juliet Tote and the Petals and Blooms Necklace. I may get the Aida Aztec Bangle. I love the Aryanna Evening clutch! My goodness, your outfit is perrrrfect! The printed top with the printed skirt that are both in the same color family, and then that pop of orangey red in the shoe...LOVE. Absolutely love. This is a favorite, for sure. Outrage is so fun! I'd totally get the tribal acrylic ring necklace. So my style. I love the Lorena necklace! I love the color combos or blue & orange! Thanks for the fabulous giveaway. Love this outfit! skirt is so pretty!! BTW, I have entered the giveaway! Fingers crossed! Hope you are having a wonderful day! Oh and I love their Normis necklace. I love their Juliet tote. parissa necklace! Lots of cute things. A statement necklace for me! I would totally get one of those great Neon cross body bags! LOVE! Looking so awesome dear...love these online boutique collection!! Great fashion boutique collection..lovely look!!! Hey dear...looking dam stunning..you should also try some Indian Ethnic Wear ...it will suits on you!!! Awesome style with lovely high heel shoes ..I like it! !